Florida Pets Alive! is ready to duplicate the highly successful & proven methods of Austin, Texas, Reno, Nevada, New Mexico, and now Florida’s own Manatee & Broward Counties to save all at-risk, healthy & treatable homeless pets in Leon County. More than 32 communities nationwide are now saving 90% or more of lost, healthy & treatable homeless pets entering animal control agencies and traditional municipal & private shelters. As in Manatee County, FL, and Thompkins County, N.Y., with the community’s help we can do the same! 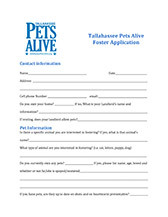 Last year, 8,369 animals entered the Tallahassee/Leon Community Animal Services Center (TLCASC) with only 3,963 being adopted or returned to their owner. 394 were “transferred” out (most going to a high kill shelter in South Florida). That means 3,924 did not it out alive, but as proven all across the nation, there is a way to give these animals a second chance at life! By following the proven program model of the successful No-Kill communities, Tallahassee can also achieve No-Kill status and save all of our lost and healthy & treatable homeless pets! Florida Pets Alive! 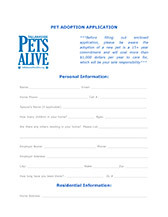 (FPA) is modeled after some of the most successful shelter animal lifesaving programs in the U.S.- Austin Pets Alive!, New Mexico Pets Alive!, and the Nevada Humane Society. As Florida Pets Alive! 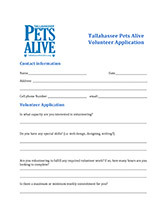 achieves operational sustainability through community and volunteer involvement, we intend to spread our success throughout the state and create a No-Kill Florida. To avoid duplicating the efforts of other local groups, FPA! is focused on developing and providing resources & programs to help support the Tallahassee shelter, rescue groups, and our citizens. This will help increase their live release rates while helping pet owners keep their pets, thus reducing shelter/rescue intake. As we increase our presence in the community, we will expand our efforts to include rescue programming and the creation of an extensive adoption, foster care and rehabilitation facility.